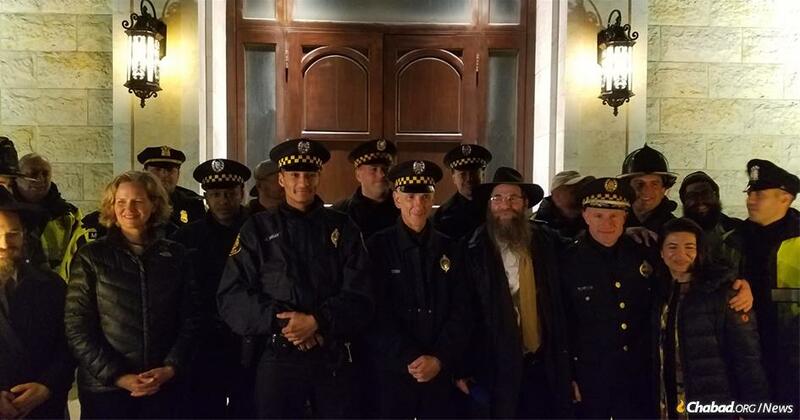 Eleven Pittsburgh police officers, who were among the first responders to the Oct. 27 mass shooting that claimed 11 Jewish lives in a Squirrel Hill synagogue, helped light the menorah at Chabad of Roslyn on Long Island, N.Y. The 11 victims of the Oct. 27 anti-Semitic mass shooting in a Pittsburgh synagogue were remembered on Long Island on Sunday night as 11 Pittsburgh police officers, who were among the first responders to the tragedy, helped light the menorah at Chabad of Roslyn on Long Island, N.Y.
Local officials and law-enforcement authorities also attended the lighting, which was billed as a show of solidarity with the Pittsburgh community and a display of Jewish pride in the face of rising anti-Semitism in North America and Europe, especially. 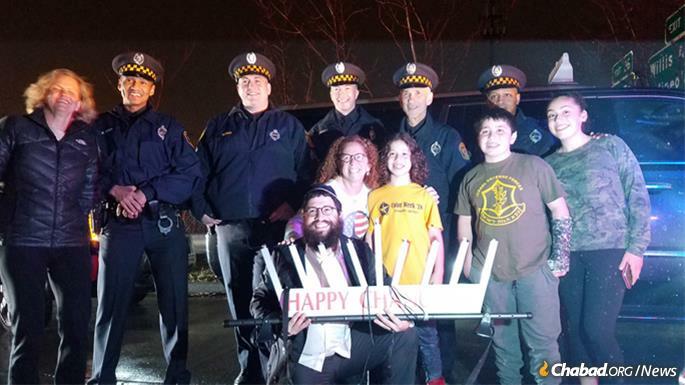 In addition to the menorah-lighting, which paid tribute to the victims and honored the officers who risked their lives to save others, traditional Chanukah treats and lively music were featured. 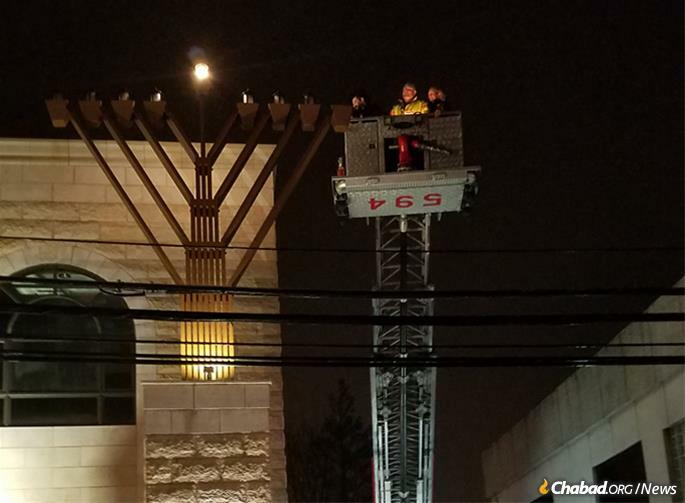 The Roslyn public menorah—the tallest on Long Island—is one of more than 15,000 public menorahs in 100 countries and in hundreds of cities across all 50 states, including Pittsburgh, where a menorah-lighting took place in the heart of the Squirrel Hill neighborhood where the shooting took place. That event, too, remembered the victims and paid tribute to first responders. On Tuesday night, a car-menorah parade of about 100 cars will pass through the neighborhood, ending at a festival at a local outdoor mall. Several thousand are expected to attend that celebration, as Chanukah celebrations across the United States and Europe see record numbers of attendees this year in response to an uptick in anti-Semitic behavior. The ceremony was a show of solidarity with the Pittsburgh community and a display of Jewish pride in the face of rising anti-Semitism. 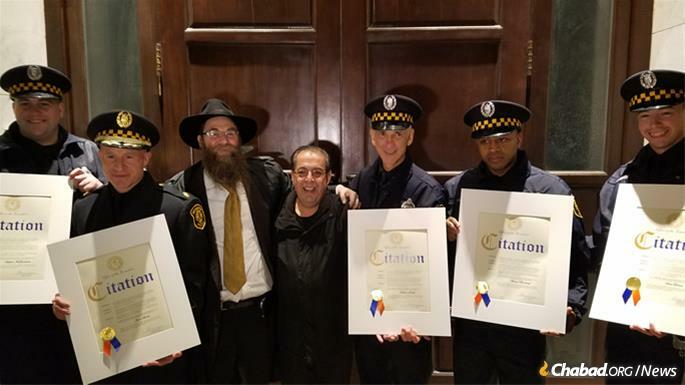 Rabbi Aaron Konikov, director of Chabad of Roslyn, with the officers. Neighborhood residents mingled with local officials and law-enforcement authorities, who also attended the lighting.